2011 is now a memory and what a year it was for Just4kicks. It was our inaugural league season with over 120 kids in our Spring and Summer League. We had our first 5v5 youth tournament which showcased some amazing local talent. Furthermore, we had over one thousand kids participate in one of our developmental programs. We start 2012 with our traditional Winter 6-week session that begins at the end of the month. We are happy to introduce Benicia Wednesday classes this Winter and Spring. As I always say, We live in the best state for winter soccer so don't let the cold keep you at home. Get out and play! Links Below. Did you know in a lot of countries a youth soccer leagues is just a one day commitment? Our traditional system of youth leagues is outdated and overwhelming on modern families. That is why we are changing the way soccer is played. The term "soccer mom" does not need to mean a stressed out chauffeur. Why not have mid week games at the same time, same day, and same place every week? Best part is there is no team mom or coaching responsibilities. Even better, no practices. Why change it? Well currently real (outdoor) soccer is played once a year. We want soccer to be offered year round locally for fun without sacrificing your weekends. If your child is playing at a higher level we bump them up an age group. No nonsense soccer simple as the sport itself with referee/coaches who have over 10 years of soccer experience. Is your child 10 + and thinking of club competitive soccer? Tryouts are usually between Winter and Spring so start training now. Coach Al Arevalo has played for Club teams such as Central Valley United (state champs) and South San Jose in the very competitive Silicon Valley soccer scene. He made varsity team freshman year for Abraham Lincoln High School. Lincoln High jumped to "A" division his sophomore year. He also experienced club level soccer and futsal in Bolivia where is was born. 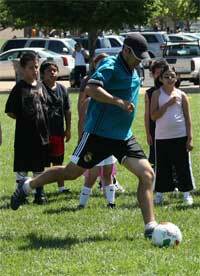 He has over ten years of teaching soccer to youth and training individual talent. His training Methods are high paced focused on touch and conditioning with the ball. He uses TRX for strength and balance and believes soccer trainers need to be able to perform and complete the training session along side the player. Motivation is key and showing energy through performance pushes players to exceed their potential. *Winter Special* 5 one on one sessions for $225 (normally $300). Sessions are 90 minutes long. Visit link below and contact us.